Canadian historical fiction novelist Doreen Brust Johnson tells her story of writing novels while having no formal education beyond grade eleven. 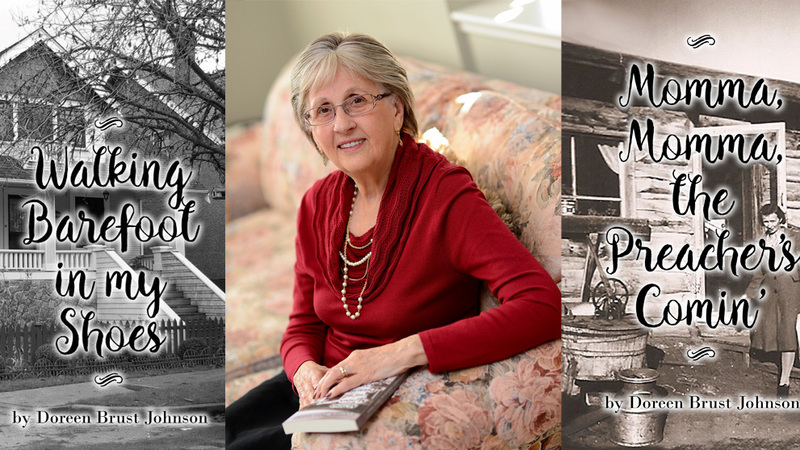 She will take you through her early years growing up on a small farm in Saskatchewan to where she is now: a published author with three books titled Walking Barefoot in my Shoes, Sounds in My Shadow, and Momma, Momma, the Preacher’s Comin’. The latter depicts her mother’s life as a pioneer in the barren north where their family struggled to survive. In addition to sharing her writing journey and how she navigated the publishing world, Doreen will tell stories of northern prairie life, making history come alive. Copies of her books will be available to purchase at the talk. There will be time for questions and conversation during and following the talk. The event concludes by 9pm. Refreshments are provided. This event is presented by the Surrey Art Gallery Association in partnership with Surrey Art Gallery, and with support from the Arts Council of Surrey. Doreen Brust Johnson was born in 1939 and raised in a log cabin north of Carrot River, Saskatchewan. Her parents were homesteaders. She spent her teen years in Vancouver. After completing grade eleven, she needed to leave school to go to work. Letters to friends and relatives and short stories for newsletters were her only outlet to fulfilling her writing desire. With an unfilled passion for writing at age 76, she seized an opportunity to write her first story. Two more novels soon followed. Doreen lives in Surrey.